In Search Of The Double! The Titanic had just sunk, the Suffragettes were campaigning and the Ulster Question was a major talking point as Sunderland AFC started what would be an epoch making season, badly. Finding themselves at the foot of the league table captain Charlie Thomson rallied his troops and along with the football clubs longest serving manager, Bob Kyle, embarked on a campaign that would take Charlie Buchan, George Holley, Jackie Mordue, Charlie Gladwin and a galaxy of wonderful footballers to the summit of English football as League Champions. As if to emphasise Sunderland’s superiority they also steamed head long into a clash with, what the National Football Museum describes as world football’s first great club rivalry, bogey team Aston Villa in the now legendary 1913 FA Cup Final. In front of what was then a World Record crowd these two giants of English football literally slugged it out at The Crystal Palace as Sunderland aimed to be the first English team in the 20th Century to win the coveted League and Cup double. In Search Of The Double! Sunderland AFC 1912/13 brings to life perhaps the greatest season ever in the football club’s long and eventful history and the club’s greatest ever team. Games abandoned due to crowd trouble, goal gluts, tragic fan incidents, running feuds on the field of play and officials losing the plot; this book has it all. It tells a social tale that is weaved in and out of the footballing exploits bringing the time alive to the modern day reader. Crammed with full page player pictures and fascinating profiles this eagerly anticipated publication will thrill both Sunderland and football fans alike. Complete match reports, full statistics and never before seen images of Sunderland on their end of season 1913 Continental Tour to Hungary are also included. An extraordinary football book; about an extraordinary football season; telling the tale of an extraordinary football team; Sunderland AFC. Just £8, postage free. With Xmas coming up what a great gift for an SAFC fan. Buy direct from the people who wrote the book!! 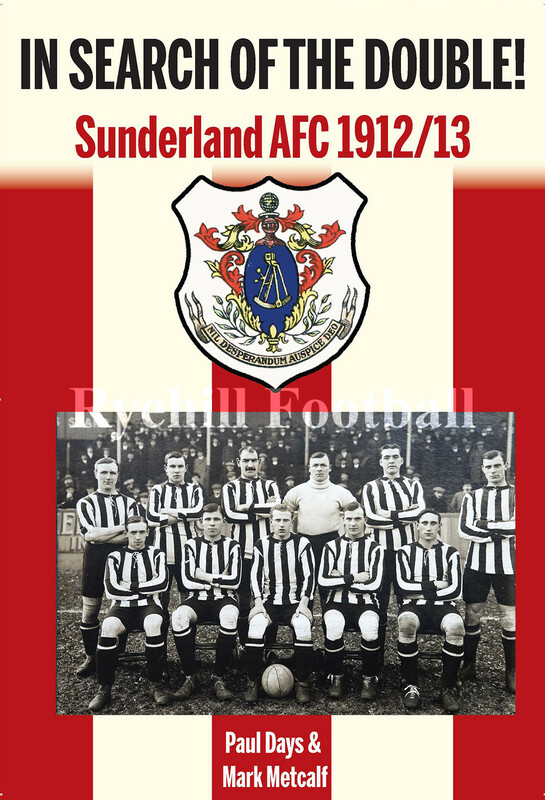 SAFC 1912/13; Almost The Double! SAFC v Man United, 1964; Roker Park’s 100,000 crowd? Art Print Celebrates Sunderland AFC’s 1894/95 World Championship Win! A Canary Saves The Day For SAFC? Roker Park Players Of A Decade – Who Will You Choose?